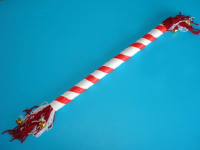 Children will love using their baton for the Christmas parade. 1. Gather your material. 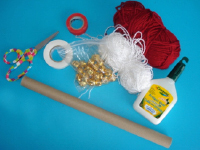 You will need a thick cardboard tube, tiny bells, red and white yarn, scissors, red and white electrical tape, and white glue. 2. 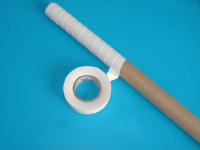 Completely wrap the cardboard tube with the white electrical tape. 3. 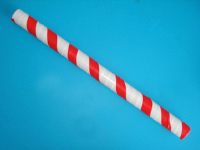 Use the red electrical tape to create diagonal stripes approximately two inches apart to give your baton a candy cane look. 4. Cut 40 pieces of white yarn and 40 pieces of red yarn. Each piece should be approximately 20 cm long. 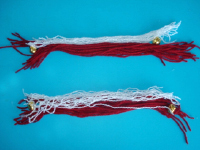 Divide them so that you have two groups, each one containing 20 pieces of red yarn and 20 pieces of white yarn. 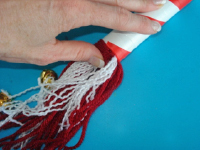 Thread a tiny bell onto either end of one piece of yarn from each group (4 bells in all). Tie a knot to prevent them from falling off. 5. 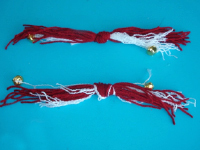 Tie a large knot in the centre of each set as shown. 6. Apply white glue inside both ends of the cardboard tube and insert one of the large knots in each one. Set aside to dry. 7. Your baton is ready for the Santa Claus parade!